I hope you all have something excited planned for the weekend, and if you don’t I’m kinda jealous of that too, haha. I’m working today before attending a party for one of my colleagues tonight, and tomorrow I’m meeting a friend to work on our bachelor thesis and boost each other’s moral. I finished this book last night, and I have to say that I never thought I’d find politics fun and interesting! The world around us was shaped before humans set foot on it. It has continued to change afterwards. Certain countries are more blessed than others with their geography, but some aren’t as lucky. Some countries have natural defence borders towards their neighbour, some are rich on natural resources, some have naturally made and deep harbours and some has a huge supply of oil and gas within their borders. Geography has started wars and ended them, it has started mass immigration and migration, and it has started natural disasters and ended them. Humans have to bow to nature in most matters, but are we moving beyond that with the technology of our day? This book tells the story of our world and how nature has shaped countries throughout time and made us prisoners in some way. It also tells the story of how humans have tried to defeat nature. Looking into Russia, China, the USA, Latin America, the Middle East, Africa, India and Pakistan, Europe, Japan and Korea, and the Arctic you’ll get a whole new perspective on what part geography might play in your life without you knowing it! 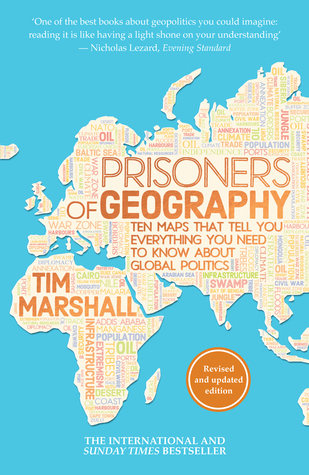 I never thought politics would interest me much, but Tim Marshall made it happen in Prisoners of Geography! Marshall does this by using a simple language with some humour in the mix. This was one of the things that really pulled me into the book! He explains the background of why things are the way they are today to some extent. I think this is what I find most difficult with politics. The way everything is connected and how it started. The media says one thing, history says one thing, and people say yet another thing. What are we to believe? Whenever I ask a politician or one of the people standing on a stand for a political party I feel like I never get the answer to the question I’m asking, even if the question isn’t too difficult. Here lies my main reason for not being interested in politics. I like to get an answer to the questions I ask, especially when I vote. Understand me wrong, I like to pay attention to what is going on in society, but then I don’t always trust the media and there we go again, haha. I felt that Prisoners of Geography was able to explain certain things to me like parts of the conflict in the Middle East and the Arctic. I found the part about the Arctic especially intriguing because it involves my own country, Norway. The book also opened my eyes to other conflicts going on in the world and why. It’s truly fascinating how much humans are able to screw things up sometimes. How arrogant Europeans back in the colonial times thought they could rule the world without taking geography, the right kind of geography, into consideration when drawing borders and how these straight line borders might affect people in the future. The book exemplifies this several times in the book, mainly in the Middle East and Africa. It is such a shame what kind of problems it has caused for later generations and their development. I recommend Prisoners of Geography to both newbies, like me, and people who have more experience within politics and geography. I wouldn’t have bought this book myself, so I’m glad my mother-in-law did because I really enjoyed this book! A great read and a great learning experience! If you haven’t read it, you know what to do! If you have read it, what did you think?